Sunset Beach, Oahu, HAWAII – (October 29, 2015) – World renowned big wave expert Ian Walsh (HAW) attacked the rising 10-12-foot surf on offer at Sunset Beach today in an ideal power match up at the HIC Pro, Presented by Vans. Dominating Day 2 with the highest wave total of the day – 16.50 points out of 20 – Walsh remained calm and patient during the all-Hawaii heat that featured Honolulu’s Gregg Nakamura, Kauai’s Kamalei Alexander and North Shore’s Schuyler Allen. While waves were smaller this-morning than yesterday, by afternoon another new swell was filling in. Known to excel in waves of consequence, 32-year old Walsh is a threat at any Qualifying Series event held at big wave breaks, especially here on the North Shore of Oahu. The Maui surfer won the HIC Pro title 10 years ago and his competitive savvy and wave knowledge has seen him advance throughout the decade. Walsh’s confidence was easily distinguishable today. Walsh threw down the biggest single wave score of the day, an 8.67, on a bumpy but expansive wall that lined up perfectly for a few fluid carves. 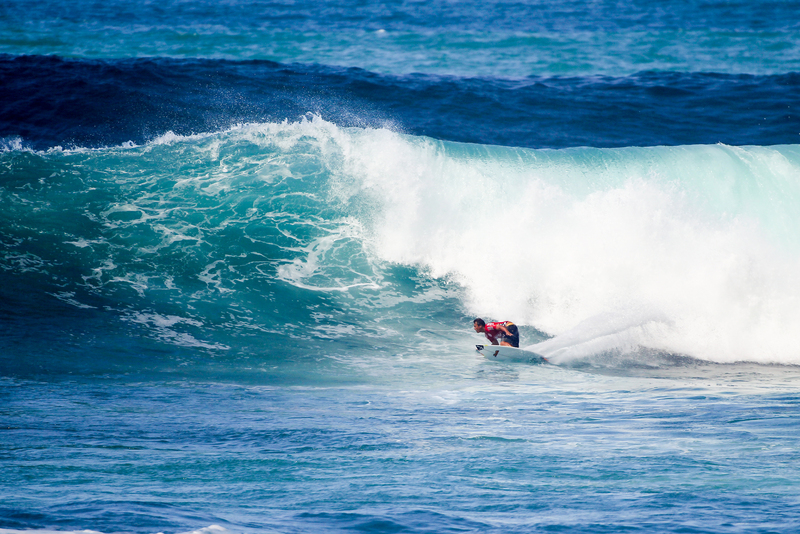 Drawing out huge turns across the wave face, Walsh displayed excellent control throughout the heat. With one eye on Pe’ahi – Maui’s infamous big wave venue, Walsh flew to Oahu yesterday and was excited to see a great forecast for the HIC Pro. “I like Sunset when it’s not small, that’s for sure,” said Walsh. “I think it’s challenging though because it is in between size still. This new swell hasn’t kicked in and the big swell we had yesterday has really subsided, so I think a big part of it is just trying to be in the right place and positioning yourself to give yourself the most opportunity. “If I’m in a contest I want to win. I wake up in the morning and I’m going to put a jersey on, I want to win the event. That’s pretty much the only drive that I need and I really like competing at home. That’s the other thing just being close to Maui around familiar friends here on the NS where I’ve spent a ton of time as a kid, and I just like competing in Hawaii. Local favorite Jamie O’Brien (HAW) nabbed a high wave score in the morning, an 8.33 which backed up an opening 6.93 for a combined wave total of 15.26 and the heat win. O’Brien isn’t a regular competitor, but when the North Shore comes alive, you can expect to find the 32-year-old vying for a slot in the most prestigious surfing series of all, the Vans Triple Crown. Another standout on the North Shore, Chris Ward (USA) used veteran knowledge in the rising Sunset conditions, whipping three turns off an 8-foot wave to score an 8.5 and advancement into the next round. The 36-year-old San Clemente native traveled with the Championship Tour for three years, finishing off each year at the hallowed 7-mile miracle. The wave action during this year’s HIC Pro can be attributed to the strong El Nino year, and Ward is looking forward to a busy winter. The HIC Pro is on standby, anticipating a monster day of West Bowl peaks that could see wave face heights reach 30 feet. A call will be made at 7:30am for what could be the final day of the event. Round of 64 – 1st and 2nd to next round. All surfers from Hawaii unless noted. Round of 112 – 1st and 2nd to next round.